New BlackBerry CEO bullish on future. Where have we heard that before? Chen, the executive chairman and interim CEO, outlined the strategy for the year ahead and, said he's up for the challenge of reviving BlackBerry's fortunes having turned troubled firms around before. Chen, who took over from Thorsten Heins in November, wrote in a lengthy column for CNBC: "I'm not focused on who BlackBerry used to be. I'm focused on what BlackBerry will be today and in the future. "Today, our company is strong financially, technologically savvy and is well-positioned for the future. In less than two months, my team and I have engineered a new strategy to stabilise the company, return to our core strength in enterprise and security, and maximise efficiencies." BlackBerry's new strategy will, somewhat unsurprisingly, see it place focus on core businesses, which are "Enterprise Services, Messaging, QNX Embedded business and the Devices business," Chen said. "When it comes to enterprise, we're still the leader," he enthused. 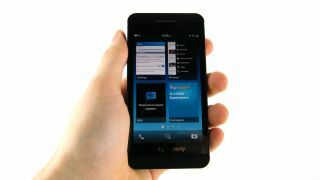 "Don't be fooled by the competition's rhetoric claiming to be more secure or having more experience than BlackBerry. "Many in the regulated industries — those with the most stringent security needs — still depend solely on BlackBerry to secure their mobile infrastructure. For governments, BlackBerry cannot just be replaced." He also says there are plans to generate cash from BlackBerry Messenger, which is enjoying a renaissance with 40m users since launching on iOS and Android in late 2013. "Our popular messaging service, BBM, is also renowned in regulated industries for being the most secure mobile-messaging service, and consumers love it, too. In the last 60 days, more than 40 million new iOS and Android users have registered to use BBM," Chen wrote. "We will continue to invest in this popular service and build out its features and channels, with plans to turn it into a revenue stream in the coming years." Is this just another charm offensive aimed at preventing the bottom falling out of BlackBerry's tumbling stock price or has Chen really got the troops rallied? Manufacturing deal with Foxconn means there'll be at least five more years of BlackBerry smartphones.